New data from the Solar Jobs Census 2016 shows that employment in the solar-power industry increased by a historic 25% nationwide from 2015 to 2016, for a total of 260,077 workers. The industry added 51,218 new jobs in 2016, a growth rate about 17 times faster than that of the overall U.S. economy, which grew by 1.45%. One out of every 50 new jobs added in the U.S. was created by the solar industry, representing 2% percent of all new jobs. Growth occurred in 44 of the 50 states. And in 21 states, solar jobs grew by 50% or more, according to The Solar Foundation. The solar industry produced $62.5 billion in direct sales, and the broader labor impact that includes direct, indirect, and induced jobs, amounted to nearly 789,000 U.S. jobs, the report said. The jobs paid more than $50 billion in salaries, wages, and benefits and produced $154 billion in total economic activity for the U.S.
Metropolitan areas also saw historic solar jobs growth, as the data in the Solar Jobs Map showed. For example, solar jobs in the Cleveland, Ohio area doubled, for a total of 1,632 solar workers in 2016. 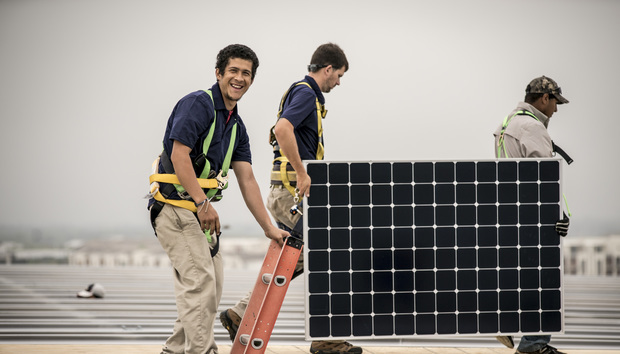 The number of jobs in the San Antonio, Texas area increased by 146% to 1,767 solar workers. Jobs in and around Albuquerque, N.M. increased 78% to 1,771 solar workers. And jobs in Tampa-St. Petersburg-Clearwater, Fla. increased 40% to 1,215 solar workers. In Colorado, the number of solar industry-related jobs grew 20%, from 4,998 to 6,004 jobs, and won praise from Colorado Gov. John Hickenlooper. "Solar power not only enhances environmental protection and health -- it helps accelerate economic growth," he said in a statement. "We are pleased that the solar industry continues to find Colorado a good state for business." Colorado ranks 10th in the nation for solar industry job creation. California, ranked No. 1 in the nation for solar job creation, saw a 32% growth in solar employment between 2015 and 2016, from 75,598 to 100,050 jobs. Massachusetts, which is in second place, saw solar power-related jobs decline by 3% from 15,095 to 14,582 jobs. 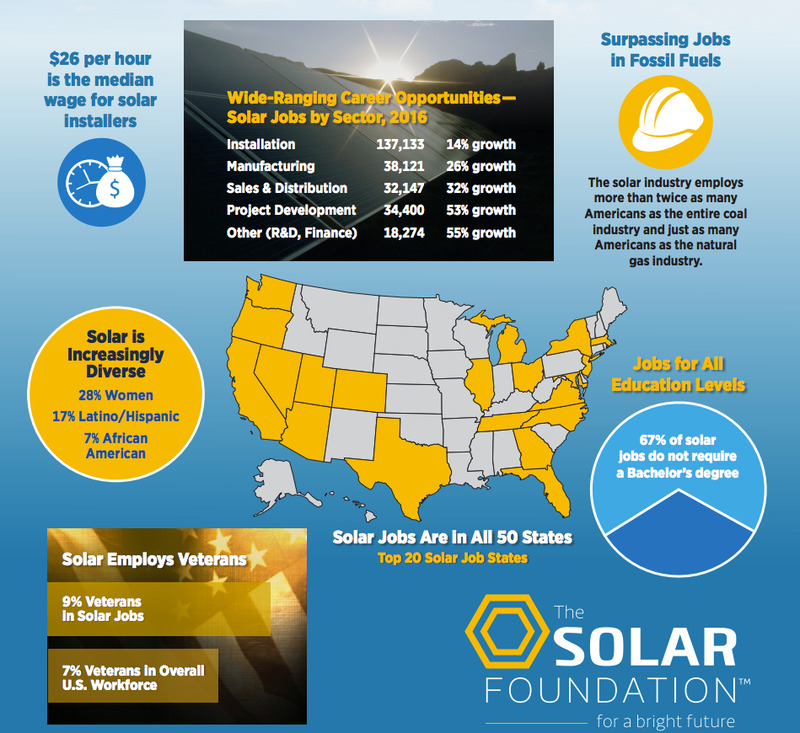 Since 2010, The Solar Foundation's National Solar Jobs Census has defined solar workers as those who spend at least 50% of their time on solar-related work. The Solar Foundation has consistently found about 90% of those workers spend 100% of their time on solar-related work. 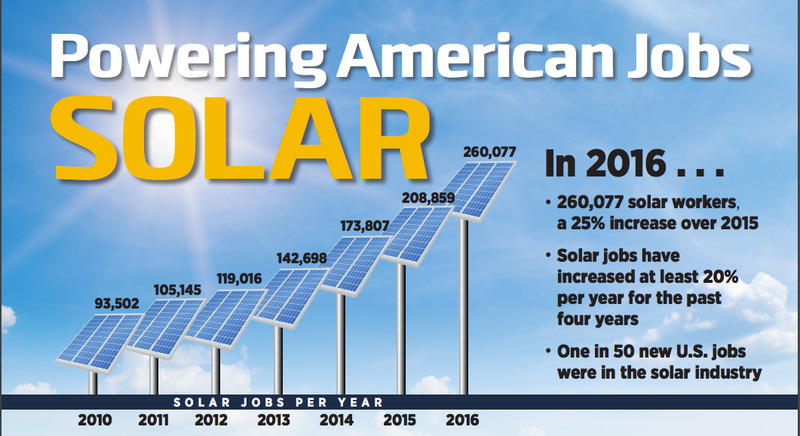 Solar jobs in the United States have increased at least 20% per year for the past four years, and jobs have nearly tripled since the first Solar Jobs Census was released in 2010. Over the next year, employers expect to see total solar industry employment increase by 10% to 286,335 solar workers. The Solar Jobs Census 2016 was part of the U.S. Department of Energy's U.S. Energy and Employment Report (USEER) data collection effort that included more than 500,000 telephone calls and over 60,000 emails to energy establishments in the U.S. between October and November 2016. This resulted in a total of 3,888 full completions for establishments involved in solar activity in the U.S.
« 802.11ay Wi-Fi: "It's going to be a very scalable spec"